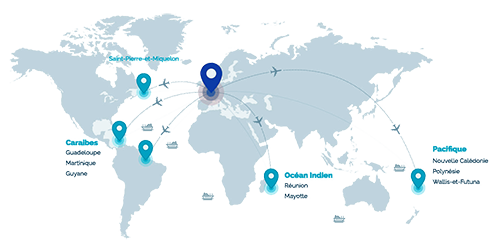 Global Audio Store, specialist in export and international shipping, sends your parcels all over the world to the French Overseas Departments and Territories. The amount of the transport depends on the total weight of your shopping cart and the country of destination of your order. Guadeloupe (including St Barthélémy and St Martin), Martinique, Reunion Island, Guyana, Mayotte and St Pierre and Miquelon. New Caledonia and its dependencies, French Polynesia, Wallis and Futuna Islands, French Southern and Antarctic Territories. We can also use other carriers on request for your deliveries to French overseas (UPS, Chronopost Express, DHL, Geodis,...), so do not hesitate to ask us for a quote, especially for any large or heavy grouped order exceeding the limits of traditional postal networks, for this you just have to send us an email request via our Customer Service indicating the desired references and specifying your full delivery address. This delivery method with tracking allows you to receive your package within an indicative time from 5 to 10 days depending on the country of destination thanks to the Post Office and the Colissimo Suivi service. Our sales department will send you by email the day your order is dispatched your Colissimo tracking number which will allow you to track your package on the post office website on www.colissimo.fr. The costs incurred for this option depend on the item(s) selected. This delivery method allows you to receive your package within 24/48 hours thanks to Chronopost. Our sales department will send you by email the day your order is shipped your Chronopost tracking number which will allow you to track your package on the Chronopost website at www.chronopost.fr. The costs incurred for this option depend on the item(s) selected. Exceptional orders weighing more than 30 Kg or not mechanizable can be delivered in 24/72h by UPS, with their UPS STANDARD service for a guaranteed 72h delivery, or by express delivery with their UPS EXPRESS SAVER service for a guaranteed 24h delivery. Any order of less than 500g too small to be eligible for Colissimo package format can also be shipped internationally with the MAX Tracking Letter service from the French Post.